Para quem achava que Tolkien criou o conceito das "torres sobre torres, montes sobre montes", "montanha de ferro e rocha adamantina" combinados fica aí essa passagem do Paraíso Perdido realçada por uma belíssima picture do Monte Olimpo com a mesma descrição onde não falta o ouro da descrição original. Os anjos rebeldes do Paraíso Perdido de Milton que voavam com literal "velocidade alada" para se reunir na fortaleza de Lúcifer no Norte do céu no livro, descrita na mesma passagem do poema ( fim do livro V), parecem ser paralelos demais com certos detalhes dos Balrogs como servos de Morgoth em Angband e Utumno. Todas as fortalezas estão no Norte, a reunião deles lá foi antes de grandes batalhas com os poderes do "Bem", Guerra dos Valar e Guerra da Ira. Utumno ficava debaixo de Montanhas e Angband era uma montanha e uma vasta masmorra e catacumba construída debaixo delas. 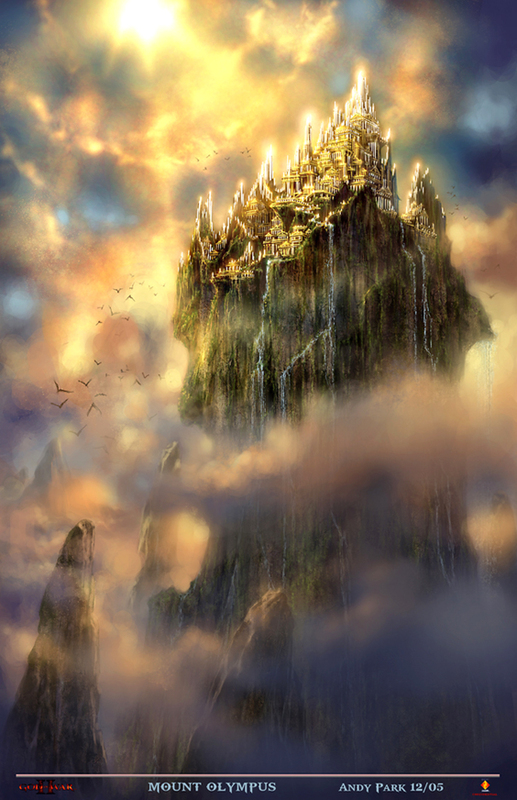 A descrição da Montanha Fortaleza de Lúcifer que, muito provavelmente, serviu de base pra descrição que Tolkien deu da Torre Negra. Comparem a similaridade do texto traduzido em prosa pro castelhano. Isso faz parte do relato de Gabriel para Adão no livro V do épico de Milton, contando a história da Guerra dos Anjos no Céu. Comparem com a descrição da Torre Negra nessa passagem do SdA aí. Depois coloco em inglês, é que a forma poética do Paraíso Perdido é meio estranha e a tradução brasileira em poema , honestamente,não ajuda a ver todas as similaridades. Então, finalmente, seu olhar foi detido: muralhas e mais muralhas, parapeito sobre parapeito, negra, incomensuravelmente forte, montanha de ferro, portão de aço, torre de diamante, ele a viu: Barad-dûr, a Fortaleza de Sauron. Perdeu todas as esperanças. E ali, na soleira escura das Sammath Naur, bem acima das planícies de Mordor, tal estupefação e terror sobrevieram que ele ficou parado, esquecido de todo o resto, imóvel como alguém que foi transformado em pedra. Teve uma visão rápida de nuvens rodopiando, e no meio delas torres e ameias, altas como colinas, fundadas sobre um poderoso trono de montanha acima de abismos incomensuráveis; grandes pátios e calabouços, prisões sem olhos,íngremes como penhascos, e portões escancarados feitos de ferro e pedra adamantina: e então tudo acabou. Torres caíram e montanhas deslizaram; paredes desmoronaram e derreteram, esboroando-se; enormes espirais de fumaça e jatos de vapor subiam, subiam e se espalhavam, até formarem um teto semelhante a uma onda ameaçadora, e sua crista alucinada se crispou e veio descendo e cobrindo tudo, espumando sobre a terra. Impearls on every leaf and every flouer. Of counterfeted truth thus held thir ears. Fire glowed amid the smoke. Mount Doom was burning, and a great reek rising. 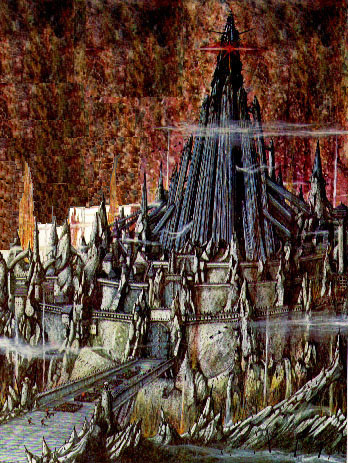 Then at last his gaze was held: wall upon wall, battlement upon battlement, black, immeasurably strong, mountain of iron, gate of steel, tower of adamant, he saw it: Barad-dûr, Fortress of Sauron. All hope left him ( Fellowship of the Ring). Novamente destaquemos algumas similaridades com Utumno e Angband: é uma montanha que fica no Norte do Céu assim como Utumno e Angband ficavam no Norte, Utumno ficava debaixo de Montanhas e Angband ficava debaixo e era , literalmente, uma Montanha. Nessa passagem os anjos rebeldes são genericamente chamados de "Poderes" e voam com velocidade alada e os Balrogs são Demônios de "Poder", Valaraukar. Semelhanças com a Torre Negra, é uma montanha que era "como montes sobre montes, com "Pirâmides e Torres feitas com diamante escavado". Olhem só "torres", "torre de diamante", "muro sobre muro", refletindo, as mesmas "torres de diamante esculpido", e o "monte sobre monte" e a sugestão de que a Torre Negra era uma montanha artificial esculpida à semelhança de um Trono, que contém não uma mas "várias" torres. Tudo isso encontrado nessa passagem de Milton que por assim dizer, foi feita para dar uma idéia do que é que a Torre de Babel bíblica tentava imitar. Reparem como a imagética é igual sugerindo dureza, orgulho, altura, a fusão do ferro com o diamante, a coroa de ferro onde os silmarils se engastam, aliás, a torre negra tinha uma "coroa" o que a fazia ser uma espécie de categral "gothica" lembrando o próprio Morgoth, envergando a coroa de ferro onde o "diamante" e o "ferro"estavam profanamente combinados. E, justamente, um pouco antes disso vem a passagem dos anjos voando com "winged speed". Pode ser coincidência? Pode , mas nesse caso em particular, com bons motivos, eu duvido muito. The rest came to sit near Ruta Skadi to hear what she could tell them. She told what had happened when she flew up to meet the angels, and then of her journey to Lord Asriel's fortress. "Sisters, it is the greatest castle you can imagine: ramparts of basalt, rearing to the skies, with wide roads coming from every direction, and on them cargoes of gunpowder, of food, of armor plate. How has he done this? I think he must have been preparing this for a long time, for eons. He was preparing this before we were born, sisters, even though he is so much younger.... But how can that be? I don't know. I can't understand. I think he commands time, he makes it run fast or slow according to his will. "And coming to this fortress are warriors of every kind, from every world. Men and women, yes, and fighting spirits, too, and armed creatures such as I had never seen—lizards and apes, great birds with poison spurs, creatures too outlandish to have a name I could guess at. And other worlds have witches, sisters; did you know that? I spoke to witches from a world like ours, but profoundly different, for those witches live no longer than our short-lifes, and there are men among them, too, men-witches who fly as we do...."
(...) From The Amber Spyglass:At the western end of a range of saw-toothed mountains, on a peak that commanded wide views of the plain below and the valleys behind, a fortress of basalt seemed to grow out of the mountain as if some volcano had thrust it up a million years ago. In vast caverns beneath the rearing walls, provisions of every sort were stored and labeled; in the arsenals and magazines, engines of war were being calibrated, armed, and tested; in the mills below the mountain, volcanic fires fed mighty forges where phosphor and titanium were being melted and combined in alloys never known or used before. On the most exposed side of the fortress, at a point deep in the shadow of a buttress where the mighty walls rose sheer out of the ancient lava-flows, there was a small gate, a postern where a sentry watched day and night and challenged all who sought to enter. While the watch was being changed on the ramparts above, I the sentry stamped once or twice and slapped his gloved hands on his upper arms for warmth, for it was the coldest hour of the night, and the little naphtha flare in the bracket beside him gave no heat. His relief would come in another ten minutes, and he was looking forward to the mug of chocolate, the smokeleaf, and most of all his bed. To hear a hammering at the little door was the last thing he expected. However, he was alert, and he snapped open the spy hole, at the same time opening the tap that allowed a flow of naphtha past the pilot light in the buttress outside. In the glare it threw, he saw three hooded figures carrying between them a fourth, whose shape was indistinct, and who seemed ill, or wounded. The figure in front threw hack his hood. He had a face the sentry knew, but he gave the password anyway and said, "We found him at the sulphur lake. Says his name is Baruch. He's got an urgent message for Lord Asriel." The sentry unbarred the door, and his terrier daemon quivered as the three figures maneuvered their burden with difficulty through the narrow entrance. Then the daemon gave a soft involuntary howl, quickly cut off, as the sentry saw that the figure being carried was an angel, wounded: an angel of low rank and little power, but an angel, nevertheless. "Lay him in the guardroom," the sentry told them, and as they did so, he turned the crank of the telephone bell and reported what was happening to the officer of the watch. On the highest rampart of the fortress was a tower of adamant: just one flight of steps up to a set of rooms whose windows looked out north, south, east, and west. The largest room was furnished with a table and chairs and a map chest, another with a camp bed. A small bathroom completed the set. Lord Asriel sat in the adamant tower facing his spy captain across a mass of scattered papers. A naphtha lamp hung over the table, and a brazier held burning coals against the bitter chill of the night. Inside the door, a small blue hawk was perching on a bracket.